Launched by Ilan Volkov, principal guest conductor of the BBC Scottish Symphony Orchestra, Tectonics is an ambitious festival that aims to explore the hinterland between experimental and orchestral music. Originating last year in Iceland, in 2013 it has expanded to include Scotland and Israel, and is set to also assimilate Australia next year. Yet its perspective is local as well as international – the Glasgow leg is closely enmeshed with the city’s avant-garde community thanks in part to the co-curating efforts of Counterflows organiser Alasdair Campbell. Saturday’s orchestral session begins in strident fashion with the colossal opening chord of Glasgow-based composer David Fennessy’s nightmarish ‘Prologue (Silver are the Tears of the Moon)’. The orchestra embellishes a succession of swirling electronic drones, rising to cacophony, before giving way to an Enrico Caruso 78 playing on distant gramophone. Morton Feldman’s eerily beautiful ‘Cello and Orchestra’ is nothing but wisps and tendrils that stretch and pulse, verging on the imperceptible. Quiet to the point of subliminal, little more than a breeze across a still pond, the drones and swells of Frank Denyer’s ‘The Colours of Jellyfish’ make Feldman seem like Slayer, while a hidden children’s choir in the rear balcony provides an eerie, spectral surprise. While Volkov guides a small string ensemble, composer Charles Ross uses an amplified sandbox to both accompany and conduct members of the Glasgow Improvisers Orchestra through ‘The Ventriloquist’, their interplay of awkward insectoid clatter calling into question the roles of puppet and master. The Old Fruitmarket forms the atmospheric setting for Hanna Tuulikki’s unique, evocative ‘Voice of the Bird’ – an all-female a cappella performance exploring the connections between Gaelic song and avian communication. Superbly imaginative and intricately scored, the piece’s playful calls and responses flit gracefully back and forth between the upper walkways of the historic venue, which temporarily transform into the monumental caverns and cliffs of St Kilda. The lavish Grand Hall, on the other hand, proves an incongruous venue for the uncompromising post-apocalyptic horrors of Iancu Dumitrescu and Ana-Maria Avram, who combine harsh digital noise with live metallic percussion and abrasive washes of guitar from Sunn O)))’s Stephen O’Malley. Saturday’s late-night sessions begin with a collaboration between Glasgow’s own Aidan Moffat and Stuart Braithwaite, along with Icelandic cellist Hildur Gudnadottir. Seated behind a minimal two-piece drumkit, Moffat guides the trio with soft but insistent beats, while the ten strings behind him simmer away. A moodily psychedelic piece blossoms, reaching frenzied heights, with Moffat reciting alternately banal and grimly surreal pharmaceutical side-effects. To close, Oren Ambarchi, accompanied by Gudnadottir, members of the BBC SSO (including Volkov on violin) and shockingly capable drummer Joe Talia, combines freeform noise rock and modern composition in a thrilling blast of raw physicality and churning rage. Sunday afternoon finds 75 of the strangest minutes ever to pass in City Halls, courtesy of local collective Asparagus Piss Raindrop. 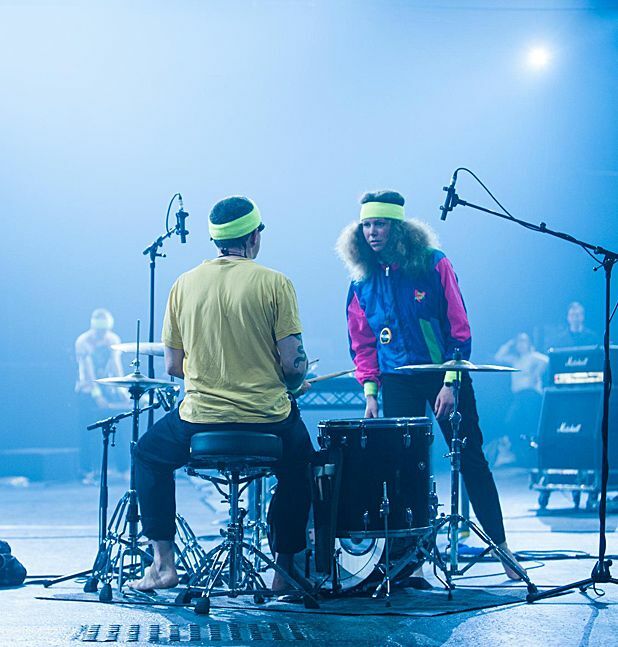 Dressed in matching fluorescent sweatbands like a sinister aerobics class, APR begin their suite on the City Halls’ first-floor promenade, but roam up and down the stairs, through the bar and end up in the cavernous Old Fruitmarket. Their performance takes in dadaism, acoustic free improvisation, gamelan, nonsense vocalese, confrontational performance art, cardio-vascular exercise, caustic noise, doom metal, Guantanomo Bay, band arguments, slights upon Morton Feldman and an extended bit of WC Fields-style slapstick business with a table piled high with equipment. Bizarre, annoying, ridiculous, confusing and thoroughly brilliant. Much of the weekend is devoted to the work of American composer and sound artist Alvin Lucier, whose pure, inquisitive approach to sonic experimentation is a delight. As with his iconic work ‘I am Sitting in a Room’, Lucier tends to initiate a process and then sit back and marvel at the results. At Tectonics, this involves using sine waves to bounce ping-pong balls off of bass drums, exploring the way in which the piercing tones of an electronic bird call ricochet around a concert hall, or getting an orchestra to play fragments of Beethoven, recording the results and playing them back in ever-more degraded and abstract loops. Most affecting is the solo piano rendition of ‘Strawberry Fields Forever’, which, through alchemical recording magic, is miniaturised and played back within an amplified teapot. The teapot stunt exemplifies Lucier at his best – questing spirit, homespun charm, subtle humour and genuinely fascinating results. Following a powerfully emotional solo set of cello and electronics from Gudnadottir, the weekend concludes with a number of orchestral premieres: Chiyoko Szlavnics’ miasmic drones, subliming between liquid and solid, harmony and dissonance; Martin Suckling’s glassy, textures and aggressive cacophony; and the exuberant fractured action-movie themes of John De Simone’s ‘Geek’. The finale is Dumitrescu’s pointedly named ‘Elan’, his spiky, metallic digital mayhem appropriated by an orchestra and perverted by another viscous quagmire from Stephen O’Malley. With more than 20 challenging and boldly adventurous performances over two days, and only the tiniest of refuelling gaps between them, there’s a considerable risk of severely uneven quality or serious audience fatigue. Yet, at least for this reviewer, every single piece was a compelling and distinct entity in its own right, making Tectonics remarkable not only for its scope and ambition, but its consistency. Neil Cooper reflects on three days of inspiring experimentalism at Glasgow's Tectonics festival.